Students of Government Secondary School, Lafia, the Nasarawa state capital, have staged a protest over the alleged killing of their fellow student by one of the sons of the Governor, Khaleel Umar Al-Makura. 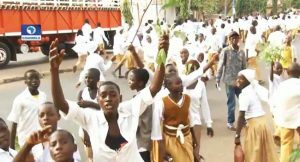 They took to the streets carrying leaves and placards with inscriptions demanding justice for the killing of Ovye Amos, a Junior Secondary School two student. It however took the intervention of the police, officers of the Nigeria Security Civil Defence Corps, their teachers and government to calm them down. The school Head Boy, Goodluck Agwu, revealed that the deceased, Ovye, had gone out to buy batteries for his torch light when he was hit by a car allegedly belonging to Khaleel around 8:00pm. According to him, the issue originated from the fact that the school lacks electricity supply. Furthermore, he complained about insecurity, stating the fact that people come in and out of the premises at any time because of the absence of security men. Addressing the students at the school parade ground, the Nasarawa state government who was represented by the Commissioner of Education, Aliyu Tijjani, expressed his sympathy and promised to bring the perpetrator to book. The area commander of Lafia area office, ACP Maikudi Shehu, assured the students that they would be briefed on the development. “It is a painful thing, we sympathise and empathise with you and we assure you that investigation is ongoing and that particular culprit as we are speaking now is under detention in our custody. “We will keep you informed of developments as they unfold”.